An Honest Review of The ASUS RT-ACRH13 Router – How Does It Stack Up? The ASUS RT-ACRH13 router is ideal for gamers who make use of the latest gen consoles such as PS4 or Xbox One. Enjoying online play and in-home streaming requires a network solution that is up to the task of handling 4k streaming as well as lag-free play, and the ASUS RT-ACRH13 is more than up to the task. 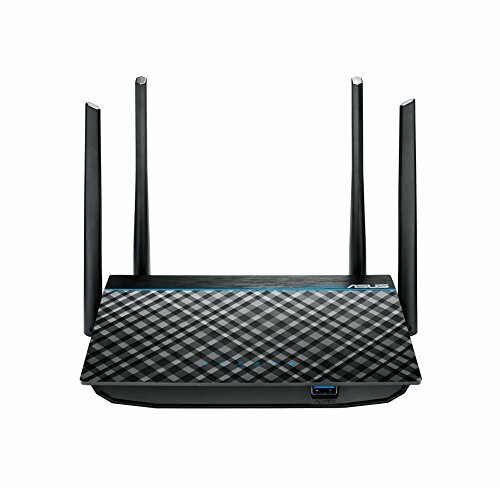 With an assortment of features to enhance online play, improve Wi-Fi range and manage the connection of multiple devices, this router could be the perfect companion for any serious gamer. Continue reading our ASUS RT-ACRH13 review to see if it fits your needs. Households with bandwidth-hungry devices or those that need to benefit from high connection speeds, connection stability as well as superior Wi-Fi coverage should make use of a router that can handle high capacities of throughput. It allocates bandwidth evenly to multiple devices and offers a wireless connection system that is compatible with multiple devices at a larger range radius than standard modems and routers. This makes the ASUS RT-ACRH13 one of the best and most functional devices for these purposes, especially when considering the price range. It's especially good for online gaming, in-home media streaming, as well as for sharing moments of gameplay in real-time. Integrated USB 3.0 support makes it easy to share media across your network using your router. It allows you to connect removable drives to the router so that it can be accessed via multiple devices in your home. This means that with a single drive, you can stream to PCs, Macs, smart-TVs as well as gaming consoles. Integrated USB 3.0 support also makes it easier for printers and devices to be shared over a home network, making it easier to take advantage of plug and play over a variety of compatible devices. The ASUS RT-ACRH13 Dual-Band 2×2 router ensures that network management and monitoring can be done simply from any mobile device or smart-phone. By using the ASUS router app, users can keep a close eye on bandwidth allocation, traffic, and network strength. The router’s web-based interface also makes it relatively simple to set up, making it perfect for those who are familiar with setting up home-networks, as well as those who are new to it. Dual-band AC1200 with 2×2 MU-MIMO technology with combined speeds of up to 1267 Mbps. Four external 5dBi antennas for improved Wi-Fi range as well as multiple device support. Easy network monitoring and management from mobile devices using the ASUS Router App. Easy to set up thanks to the web-based ASUSWRT interface. Integrated USB 3.0 port for sharing removable drives over the network at greater speeds. 128MB Fast memory architecture for simultaneous downloading and streams. Dual-band 802.11av Wi-Fi with speeds of up to 867Mbps (5GHz) and 400Mbps (2.4GHz). On the positive side, users of the ASUS RT-ACRH13 have been impressed with its high bandwidth capacity and performance. The device has also been praised by many users for the strength and range of its Wi-Fi. Reliability reports are also overwhelmingly positive, as well as impressions on the number of devices that the router can connect to at once, with most users getting full functionality with over 12 devices being connected. Some of the negative points; many users have had a difficult time with port-forwarding, after-sales services, and setup, finding the processes of these tasks a little too complicated. Users complain that the influx of features makes the device unreliable and difficult to operate. While these negative reviews are present, they are few and far between and are often based on the users’ own ability to operate the product. Despite the negative reports, this router is one of the best ones that you can find in the price range, with many of the extra features being more of an added bonus. Since it is tailored for home use, and not commercial use, it is simple to set up and performs admirably for online play as well as 4k streaming on current generation consoles. If like me, you use your router for online gaming, streaming play or simply connecting multimedia devices in your home. ASUS RT-ACRH13 is the perfect companion for gamer’s and media fiends that have high bandwidth demands coming from multiple devices, and are looking for a reliable, high quality and cost-effective network solution. In this ASUS RT-ACRH13 review we will cover if this device is fit for you or no. This device is intended for home use and networks with a high demand for bandwidth. This makes it ideal for homes that need to connect up to a dozen devices at a time, make use of in-home streaming platforms such as Netflix or smart-TV’s or are looking to take advantage of the ‘internet of things’. Besides that, this router is ideal for hard-core gamers that can’t afford to suffer network drops, unreliability or high lags during gameplay. It is also ideal for those that are looking for a reliable solution to stream and share their own gameplay in real-time. Users who are looking for intricate networking solutions that go beyond the home may find that this device has limited functionality for those needs. On that note, those looking for a simple solution for basic web-surfing and applications might find that the functionality of the router is a little over-kill. The functionality of this product is designed around maximum performance when it comes to bandwidth allocation on an in-home network to allow for high speed online play, streaming and in-home sharing. If your network needs are not as complicated as this, then you might want to go for something a little simpler. It has a wide coverage area. It's Dual-Band Capabilities guarantees High-Speeds and comfort. It requests an upgrade after initial installs are done. You MUST change the standard setting to match your own if you want to benefit from its full potential. The device’s dual-band support makes the ASUS RT-ACRH13 compatible with a range of devices, from gaming consoles, PCs, and Macs, as well as mobile phones, tablets and anything else that benefits from the ‘internet of things’. It provides connection speeds that total up to 867 Mbps on 5GHz and 400Mbps on 2.4GHz. The router’s MU-MIMO technology allows for better multiple device performances that allow optimal allocation of bandwidth to each connected device in your home. With this technology, devices can send and receive data simultaneously, as opposed to SU-MIMO devices which need to prioritize the sending and receiving of information to devices on a singular basis. The RT-ACRH13 is designed to provide maximum functionality and performance when being used on multiple devices. 2×2 MU-MIMO technology supports smooth and even bandwidth allocation amongst multiple devices in your home. Besides this, the router’s integrated USB 3 port allows data from flash and removable drives to be shared across the network by integrating with the router itself, while four external 5dNi antennas ensure improved wireless range and multiple device support. To ensure network responsiveness for tasks that are heavy on bandwidth, the ASUS RT-ACRH13 is fitted with a quad-core A7 processor. This makes in-home streaming a breeze, even when streaming up to 4k. Besides this, the quad-core processor provides unprecedented WAN to LAN speeds, ensuring lag-free play, network stability and the support of more users without taking a hit on your connection speeds. This, in conjunction with the device’s 2×2 MU-MIMO technology, allows for speeds to be shared across the network that adds up to a maximum of 1267Mbps; making it a champion of performance, functionality, and reliability. The Asus RT-ACRH13 Router box comes packed with a small documentation flier, an installation guide, a wall power adapter, an Ethernet cable, a special VIP warranty that offers some extended benefits and of course the router itself. It has a data transfer rate of 1167 Mbps which is great! Has four external antennas with a 5 dBi gain level which easily explains it's wide range coverage. The following power requirements are necessary: AC 120/230 V (50/60 Hz Frequency), it has four LAN ports and one WAN. A USB 3.0 slot is available if you wish to extend it's memory or even create your own personal cloud. If you are looking to get the most out of online play on current generation consoles and a solution that enables smooth streaming of up to 4k. Need a network system that can support a multitude of devices without compromising on performance or need to get the most out of Wi-Fi ranges and stability, then the ASUS RT-ACRH13 is the ideal router for you. The infrastructure, software, and hardware in this device make it a top contender for the most cost-effective, reliable and functional routers in its price range; and its affordability makes it perfect for casual and professional gamers alike. If you have any questions for this ASUS RT-ACRH13 review please contact us at any hour.